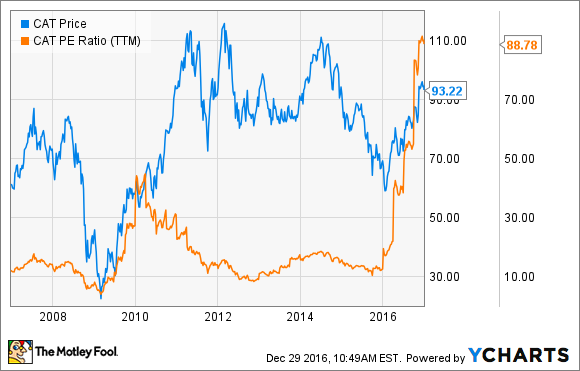 Caterpillar Inc. Soared Nearly 40% in 2016. Will That Continue Next Year? The company has taken steps to restructure and reduce costs across its business, but with a 40% gain this year, is there any room for it to run in 2017? However, 2016 brought Caterpillar investors some relief as the stock rebounded nearly 40% despite its top and bottom lines consistently declining. Even more recently, its stock received a boost from Donald Trump's campaign speeches. When I see the crumbling roads and bridges, or the dilapidated airports, or the factories moving overseas to Mexico, or to other countries, I know these problems can all be fixed, but not by Hillary Clinton -- only by me. The question facing investors is simple: Is this rebound set to continue in 2017, or is this merely a dead cat bounce? There doesn't appear to be any global improvement in Caterpillar's machine retail statistics, which combine sales statistics from its resource industries and construction industries segments. Caterpillar's three-month rolling sales figure was down 17% across the globe in November, which was worse than the prior month's 12% decline. The only bright spot was in Asia-Pacific, where retail sales were up 11%, but that was easily offset by declines of 32% in Latin America, 25% in EAME and 19% in North America. Caterpillar's other retail segment, energy and transportation, didn't fare much better, suffering a 25% global drop. Zooming out on energy and transport's retail sales over a longer time frame shows just how brutal it's been. Data source: Caterpillar retail statistics. Chart by author. Then came something interesting: Caterpillar's management noted that consensus analysts' estimates were "too optimistic" considering looming headwinds and no significant rebound in mining or oil and gas. "They are cutting guidance, and now beginning to talk about earnings numbers that put a cloud of uncertainty over whether they will support their dividend," said Morningstar analyst Kwame Webb, according to Reuters. "But the stock just keeps moving higher. It's a real head scratcher." To be fair, Caterpillar's dividend isn't likely to be cut. The company has historically produced plenty of cash flow to cover the dividend and it has plenty of cash on hand to bridge the gap during a rough quarter. That said, investors raised an eyebrow in June when the company opted not to raise its dividend as it typically does, which speaks to management's belief that business isn't likely to rebound significantly in the near term. Additional bottom-line pressure will be put on the company's earnings thanks to $500 million to $600 million more in short-term employee incentive compensation during 2017 compared to 2016, and with Caterpillar Financial's profit expected to decrease by $100 million. If you believe this is as bad as it gets for Caterpillar, and are trying to buy as its business bottoms out, the truth is that that optimism might already be priced in, as its valuation has soared right along with its price. Now, of course, that ratio is elevated because it isn't adjusted for restructuring costs. However, per Morningstar estimates, Caterpillar is trading at a forward price-to-earnings ratio of nearly 36, which is a very high valuation for Caterpillar's stock historically. Sure, Trump's pledge to spend $1 trillion over a decade on building infrastructure is encouraging for Caterpillar, if it comes to fruition. 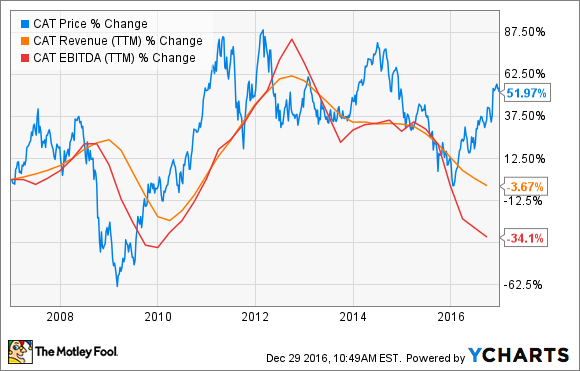 But the truth is that Caterpillar is already trading at a rich valuation and it needs a global rebound in mining and oil and gas to keep this stock price rebound going throughout 2017-- and that doesn't seem at all likely to materialize.